Spaghetti western has a simple storyline. There is always a hero, alone against everybody, trying to free the oppressed against greedy and emotionless villains. Almost every spaghetti western can fall into that category, and it was refreshing to find one as different as it can be. Starring Franco Nero, living legend of the genre and original “Django”, as half breed Indian Keoma the film tried to be more philosophical than other movies of the genre. Its racial component was very strong, and the fact that it’s made in 1976 (when spaghetti western slowly fade out) was also intriguing. Cold War entered its last phase, the United States went out of Vietnam, and “Keoma” was the protector of the third world. He was the messenger of all those caught in between, savior of the oppressed. Enzo G. Castellari, director of the movie, in the beginning made an homage to John Ford and Howard Hawks, but immediately gave hints about different kind of western we’re about to watch. 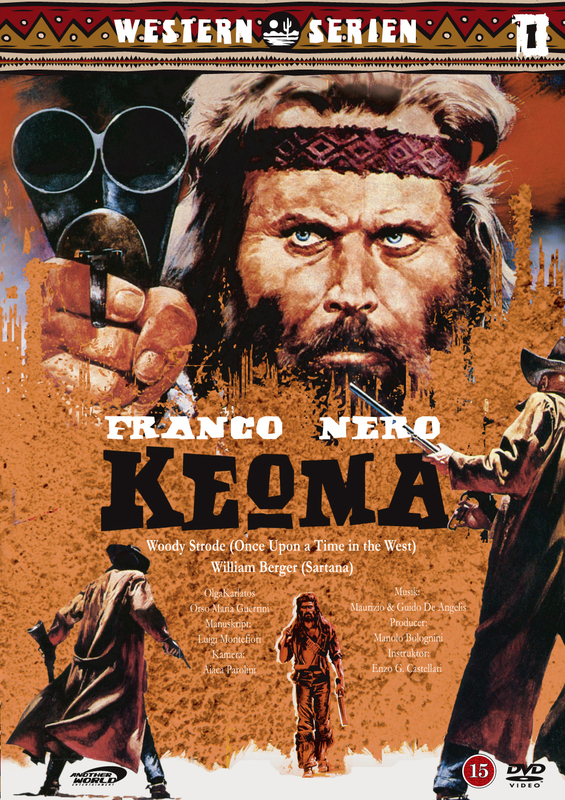 Keoma’s narrative starts with the return of Keoma (Franco Nero) to the town of his upbringing. Keoma’s dual heritage is the consequence of the massacre of a Native American encampment. He was saved from the massacre by an old woman (Gabriella Giacobbe). She reminds me of Bergman’s Death, and Keoma says to her at one point that it seems the death follows her everywhere. His native blood is mixed with the influence of his father (William Berger), a rancher who took him in after the massacre. That makes Keoma the best of the both worlds. Freedom. On his return from the war, Keoma finds out that the town is enslaved by Caldwell (Daniel O’Brien), an ex-soldier still in command of his men, who is buying the town. The town is divided into two sections. There are the healthy, and those who have “the plague”. The infected are kept in isolation, and at the beginning of the movie Keoma saves a pregnant woman from that destiny. After that, the triangle of symbols is complete. Old woman represents Death (we could see something similar in the “Sons of Anarchy”), Keoma represents Freedom, and unborn child/pregnant woman represents Life. The question that arises is: What is Life without Freedom? Without Freedom, there is only Death. We can’t see that question answered until the end of the movie when the story is again in the same place where it started. At film’s opening scenes we can see the old lady scavenging around, and when she sees the rider – she stops. When she recognizes Keoma, she asks him why he has returned. Keoma’s answer is: “The world keeps going around and around so you always end up in the same place.” The whole movie is explained by that sentence and the closing scenes are very much alike to that opening. Characters and the dialogue are the same. Symbolism and mysticism too. The main plot of the movie is fairly simple. Keoma comes back, finds enslaved town, and reacts to injustice. However, it’s necessary to know something about the way spaghetti westerns were seen in the sixties and the seventies when they were made in Italy. Cinemas in Italy at the time were open in the evening after dinner, and very much as early Nickelodeons you could enter to the screening at any time during the film. That’s the reason why the genre often consists of effective episodes of a firefight, which could be seen for itself, rather than a deeper interconnected narrative. We can see that in “Keoma”, just as we can see it in Corbucci’s “Django”. But, unlike “Once upon a time in the West” or “Django”, “Keoma” has an even deeper message. Here, the bystanders are also part of the story. Keoma is half breed and his partner in the community is an Afro American. Symbol of race here is very important because in “Keoma” there is no clear distinction between civilized and uncivilized world. Everything is wilderness, and everything is lawless, non-existent rules of the Cold War made “Keoma” possible, as a symbol of reason and freedom, a symbol of the divine. In a scene very close to the end of the movie Keoma is left in the rain. He could be the destiny of humanity. Associations on Homer’s Iliad are made, his destiny is fulfilled. He’s almost like Christ. In the pessimistic world there’s no place for idealists. That’s the reason why Keoma is the perfect symbol. As every hero of spaghetti western, “he has no name, no place and no nation” and his ideological values are necessarily universal. “Keoma” is the symbol of all revolutionaries during the Cold War. And revolution is, as you know, the never ending cycle of fighting.